This poster frame holds an 11" x 17" image! Shop over 100+ retail sign frame options, we have thousands in stock! 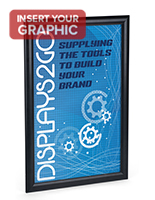 5.5" x 8.5" 8" x 11.5"
This poster frame is a great countertop marketing tool. 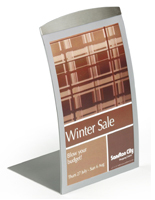 Featuring a stylish curved design, this poster frame, also known as a sign display, attracts attention from every angle. 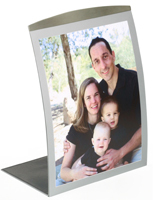 This poster frame is made of durable, powder-coated aluminum, with a black finish to easily coordinate with any decor. 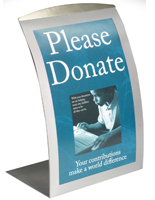 This sign display, poster frame is designed to hold 11"w x 17"h graphics. 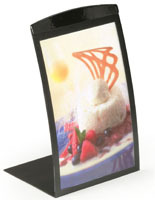 With its contemporary design, this poster frame can be used to display notices, advertisements, pictures and menus. It is ideal for use in retail stores, banks, or even restaurants! 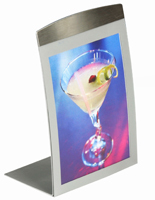 We also sell the curved poster frame in a silver finish as well. This poster frame features a magnetic border, allowing you to make quick and easy poster changes. To change your graphics, simply lift up the magnetic, non-glare lens and slide your graphics beneath. The magnetic flip lens will hold the content securely in place. 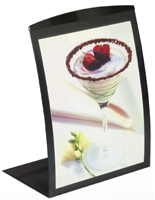 We supply the poster holder with a non-glare lens to protect your graphics from being damaged, as well as preventing reflection from hindering your messages. 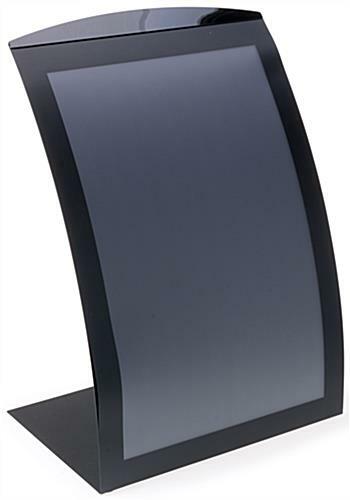 This curved poster holder is a great way to draw attention to your artwork. 13.3" x 20.5" x 8.8"